I realize it’s only been one day since my last post, and only two since my last time talking about Saints, but a lot happened today! I thought now might be a fun time to talk about word counts a little, too. I’ve talked a little about this before when I was explaining why quantity is sometimes as important as quality, but now I wanted to talk a little about word counts for first drafts. For as long as I’ve been writing, I’ve always pursued a very specific word count. For Ronan, I knew that high fantasy could probably hit 150k and be safe, probably even more. Every draft I wrote was written in a way that waaaaay stretched events out, and that tried to pack as much (or sometimes as little) as possible in a single story. With Mason, I had it in my head that I didn’t want to pass 100k because it was going to be YA urban fantasy, and I thought it was going to be my first novel published (ha!). So, I really scaled back on things. I didn’t spend as much time in the world as I should have, and I didn’t allow my readers to get to know my characters well enough. When it came time to write Alex, I also had this word count brain on, as well. It felt different because I actively knew Alex’s entire story. Both Ronan and Mason are constantly evolving, and while the core reason for writing their stories remains the same, the general, and often times specific, details change a lot. Alex’s story has remained mostly the same since the beginning. There was actually this funny moment during this draft while I was writing, and I thought I was so clever with this scene. It was going to hurt in an awful way, and it was going to really make my characters take a hard look at themselves. I was doing that sort of evil cackle, tapping the fingers together in a spinning chair thing. This was right around the time that I was also rereading the original draft (oi, it’s bad) to make sure I wasn’t missing any big details that I wanted to keep. Well, lo and behold, twelve years is a long time, and I’d forgotten that I’d already written this exact scene for these exact purposes. Thus, going in and saying I wanted to stay under 100k for Alex was easy because I kind of already knew the scope of his story. This brings us to the Pen boys. As I’ve said before, Mason was my first real attempt at a novel that wasn’t Ronan in twelve years. After Mason kind of fell off my radar, I started working on Alex, but still, that was an old hat. I wanted something new. I wanted to challenge myself. The Pen boys were born, and a funny thing happened. When I sat down to write, it was with that mindset, that I should probably aim for about 100-120k, but not much higher than that. Okay, I said, that’s fair. That’s a YA urban fantasy. Oh, what a fool I am. The Pen boys was going to be 180k no matter what I did. It was my first brand new idea. I’d had Ronan and Alex both for twelve years, and Mason for almost a year. Pen boys was birthed at the end of April, and I started writing four days later in May. And it just–took off. Like a literal jet plane. I was blindsided by it. Here were these five brand new souls that I couldn’t wait to play with. Now, if you’re currently reading the first draft of Pen boys (hi Patrick and Chelsea! ), I want to take this moment to apologize because good grief, that’s a–that’s something. It’s, uh–I guess what you’d call it is what unleashing my imagination looks like. All thoughts of how long the novel should be went out the window. I just dove in headfirst and didn’t look back. I couldn’t. The words got away from me. I wrote, and wrote, and wrote. Many things don’t make sense. Some subplots took wild turns or disappeared altogether. The real plot took, like, 20 or something chapters to even briefly make an appearance The Pen boys, in a way, is kind of like fanfiction. Which makes no sense because it’s not based on anything, but I wrote it like I was writing fanfiction. I couldn’t stop. I just held on for dear life and let it all happen. 180k words later, I’m aware a lot of it needs to be cut and reshaped, and I’m very, very excited to dig into the edits I’ve been gifted and really make this story something beautiful. But, for the first time, I stopped thinking about my word count and instead thought about just my words. I didn’t worry if any of the scenes were unnecessary, or if I should maybe pare down on the existential crisis internal monologue, or if plots didn’t quite fit together yet. I just wrote. I upended my entire soul into that novel, and when I finally took a step back, it was the size of two. Going into the second draft, I’ll put my word count hat on and try to make it into a 120k word novel at best. With Saints, the same kind of thing is happening, but it feels so much more different. I think I needed to write Pen boys first so I could just get twelve years of pent-up ideas out at breakneck speed, and after that was done, I could finally write the novel I was meant to. Don’t get me wrong, I love my Pen boys with all my heart, and I’m absolutely going to finish writing their series. But Saints–Saints is important. Saints is one of those stories that I think people need to hear. Beyond the LGBTQ+, POC, and disabled characters, beyond the stories of abuse and much needed feminism and the topic of religion, Saints covers a lot of important ground. Yes, I’m tooting my own horn. I’m not saying Saints will change the world or anything, but I am saying it’s a story that needs to be told, one that needs to be read. And so, going into Saints, I’ve felt a lot more grounded. I can very clearly see the path these characters are on. Sure, sometimes they throw me for a loop, but not nearly as much as the Pen boys did. Not only is this a story that needs to be read, I think it was a novel that I needed to write. Their story has been waiting inside that crazy brain of mine for who knows how long, and it feels damn good to finally have it out and about. And it’s almost done! I finished part two today. When I posted about 100k words, I knew I only had two chapters left to write of part two, but it felt kind of surreal wrapping up Landon’s last chapter of part two today. Part three is going to be a breeze. I do need to outline it again to account for some small changes, but the path is, again, very clear. It’s probably going to be much shorter than the first two parts by about half the word count, so I’m looking at coming in around 150k at the end of this draft. Which is funny, really, because I didn’t set myself a goal this time. I didn’t say I had to reach a certain word count, or that I couldn’t go over one. After the fiasco that is all 180k of the Pen boys, I realized something vital. First drafts shouldn’t have word counts. Second drafts, sure, but let that first draft do whatever the hell it wants. Let it just run wild. Your words deserve it. As always, this got longer than planned. No one’s surprised. I really like where part two’s ended. And just in case anyone reads this once I’m famous and traveling the world, don’t worry, Miles is okay. On the topic of word counts, it’s the end of November! As prefaced in my original nano why post, I did not participate in NaNoWriMo for the millionth year in a row. I’m not sure I ever will participate in it, but I did keep track this year for those of you that might be curious. Drumroll, please. We have our final word count: 68k. I intended to post the chart, but I don’t have it saved on my personal laptop, so I don’t have access to it right now, and I’m not interested in recreating it. I started the month of November with 42,027 words exactly for Saints, and I’m wrapping up on the very last day with 110,693, which puts me at a very precise (and hilarious) 68,666. Today’s word count was 7,226, which I’m rather proud of considering I was starting to lose steam probably around 5000, but I knew the shape of Landon’s chapter, and just wanted it done. And now begins the journey of part three! Our cast of characters has grown exponentially, and there’s going to be a heck ton of drama in part three followed by potentially one of the worst cliffhangers in history, and I can’t wait to start it. I already know whose POV the first chapter will be in, and I’m very excited to begin. For now, though, I’m going to put away the books I “accidentally” bought on Black Friday from B&N, take a shower, pamper myself with a face mask, and maybe even go to bed before 11PM. What! I hope Friday tomorrow finds you well and rested, and maybe full of words. PSS (Post Script Spoilers): This week’s research has included this bone-chilling video of a hyena laughing (which was followed up by losing 40 minutes to watching The Lion Whisperer), looking at city gardens, thinking about Magnus Bane, checking out the catacombs of Paris, and staring at a jeep. Also, desert vibes. Do with this information what you will. Hell, this makes Saints sound so much cooler than it probably is. 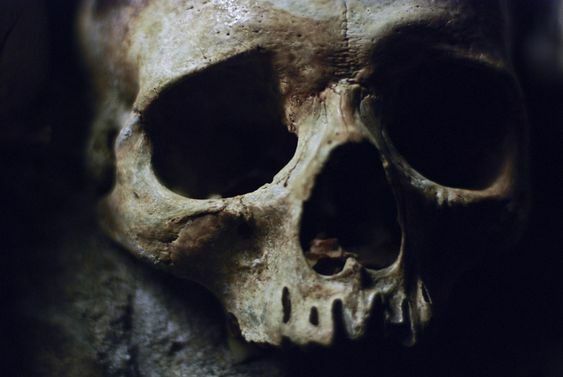 And here’s a picture of a skull not because I’m trying to be creepy, but because Landon is creepy as hell.